His Grace, Bishop Irenei, the Administrator of the Diocese of Gt Britain and Ireland served the Vigil Service on Sunday evening 27th August, for the Dormition of the Most Holy Mother of God, and was assisted by Archpriest Vitaly, and Protodeacon Dionysus, and in the congregation was the Archpriest Paul Elliott. 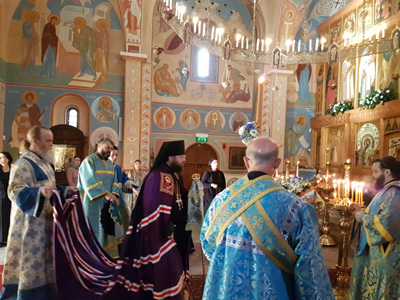 During the service after the Gospel all the congregation venerated the Dormition Icon and were anointed and given the blessed bread to sustain them during the service. 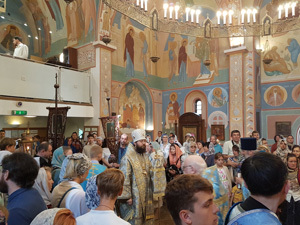 On Monday 28th August, the feast day of the Cathedral, His Grace Bishop Irenei was greeted by the pealing of the bells and met at the west door by the Cathedral’s Starosta with the traditional gifts of Bread and salt, symbolising hospitality and friendship, which Vladika Irenei blessed. After the entry prayers, the Bishop was vested in the Church. Vladika was assisted by Archpriests Peter Baulk, Paul Elliott and Vitaly Serapinas. During the reading of the Hours, Vladika Irenei awarded Archpriest Peter Baulk with the honour of wearing a Jewelled Cross. The cross was a personal gift to Fr Peter and was given to Vladika when he became an Archimandrite.